Senator Obama's recent speech about race was an Emperor's New Clothes moment for this nation. A lot of Americans had been feeling pretty darn good about our progress in racial reconciliation, embodied by our first viable biracial presidential candidate. But this speech and the split reaction to it revealed the true condition of race relations in America: generally, white people still don't get how black people see things, as Nick Kristof eloquently argues. That is, if we're over twenty-five or so. Mr. Kristof's thesis might not hold as true for young Americans. Teens and twenty-somethings think and talk about race so differently that it's almost as if our country's divided by age instead of race. Granted, I live in Boston, which likes to think of itself as this society's hub but might actually be a strange little island unto itself. But tune in to the humor about race in youth culture, where people of all races are processing the pain in a raw, real way. Meanwhile the majority in my generation secretly tire of the word "tolerance," hoping it might be time to move "beyond the issue." That's what Senator Obama tapped into when he told us earlier in the campaign that there's "no black America and no white America, only the United States of America." White people liked that, and black people accepted it because they know he gets their view of seeing things. But in this recent speech, the Senator told the truth: there are still two ways of viewing history in the past and history in the making. [She is] a woman who helped raise me, a woman who sacrificed again and again for me, a woman who loves me as much as she loves anything in this world, but a woman who once confessed her fear of black men who passed by her on the street, and who on more than one occasion has uttered racial or ethnic stereotypes that made me cringe. 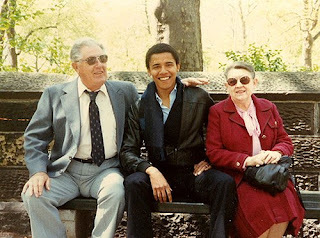 In his book Dreams From My Father, he also told of his paternal grandfather who "didn't want the Obama blood sullied by a white woman." Why not quote them equally? Because the heart of the speech was to show that he gets how blacks see things -- he talked about "our community" when he was speaking to blacks, but addressed whites as an outsider, despite painstaking diplomacy in the beginning and at the end. Ending with a story about a twenty-three year old white woman and an older black man coming together around his campaign, Senator Obama repeated his hope that one day we might indeed move "beyond racism." But, as he eloquently reminded the nation, that day is not here yet. With new polls showing him falling behind Mrs. Clinton, I'm wondering if the risk was costly. Naming the naked Emperor makes an unseeing crowd feel foolish, and we typically take it out on the messenger.